I walked through the door and fell in love. Not with a stranger seated within Café Sperl, but with the coffee house itself…with the decor and atmosphere, but mostly with the second hand of the clock. It’s kind of hard to come up with new things to say on a fresh visit to another coffee house. They do coffee. And cake. It’s great. Next. Not so with Café Sperl, though. An early Saturday morning meant few guests. Just a bespectacled gentleman in the corner with a newspaper: one of several regulars that appeared during my stay. And there was me, of course, instantly enamoured of the gorgeous setting. The entrance way alone felt like a Wellsian portal to another world; all wood, glass, and polished mirrors. The patterned red upholstery fading gracefully with age. The huge brass lamp fittings with a hint of Art Nouveau about them. The tall ceiling decorated in white stucco. The marbled tabletops on decorated metal plinths. And at one end, a piano ringed by carved wooden panels and an old clock, with a second hand that circled like a runner forever trapped on the last lap of the 10,000 m – tired but determined. I may be out by fifty years, but it all felt Edwardian. The sort of place you might enter with a cane, top hat and the very best of moustaches. As if the late 20th century never happened. Look out the window, and opposite is a 130-year-old house in the late historicism style. Instead of cars, you half expect to hear the rattle of carriage wheels and rushed clop of horses. One side of the coffee house features three billiard tables, an array of newspapers and a little corner for kids. I even spotted two high chairs in the same dark bentwood design of the traditional coffee house chairs, which was rather sweet. 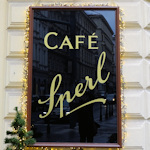 Turns out Café Sperl dates back to 1880. One of Vienna’s big theatre and opera houses is 200 m away, so this coffee house was always a haunt of creative spirits, but, curiously, also the military, which no doubt led to some robust discussions around the piano on late Sunday evenings. Artists versus Archdukes, books versus bombs. An immaculately-dressed waitress brought me a house breakfast with quiet, studied efficiency. This included a selection of rolls, jam, butter (7/10 on the spreadability index), and a pot of coffee good for over two cups. The Sperl actually has quite a broad menu, almost restaurant-like in its size – everything from a croissant to baked Camembert. Coffee prices sit in the upper middle segment, I’d say. I loved it. This may be where I go to write my next historical novel. The Sperl is closer to the centre that you might think at first glance of a map. At the time of visiting (January 26, 2019), open daily from 7 am to 10 pm (Monday to Saturday), 10 am to 8 pm (Sundays and holidays). Closed Sundays during July and August.